Holy smokes! Father's Day is this Sunday! Combining my love of real raw dark unadulterated (i.e. crap free) chocolate (sweetened with maple syrup) and my love of Sacred Grounds organic fair trade coffee beans. 2 coffee beans in every square.... An espresso hit that will get your motor running and humming. Sold in 100g bags at Broth Bar & Larder. Limited quantities so get in quick! We wrote on the packet that this one is for the blokes but I reckon there's going to be a tug of war between the sexes on these babies. Our mint carob bears are flying off the shelf faster than anyone can say "What?! Only 3 ingredients?!?" Yep, only organic raw cacao butter, organic carob powder and Young Living food grade / therapeutic peppermint essential oil. NO ADDED SWEETENER WHATSOEVER. Because carob is sweet enough. And no milk powder, soy lectins and emulsifiers found in leading competing brands. Which makes them totally guilt-free. I've never really been a huge fan of carob but with the added fresh taste of peppermint I love this little bears. And don't these guys look super cute too! In order to reduce reliance on disposable cups we have in stock these insulated hot drink cups for your take away broth or other hot drinks. Help reduce the 23 billion coated paper or Styrofoam coffee cups that end up in landfills every year with this reusable alternative. Our square stainless square lunch boxes with removable cross divider were such a hit that we are also retailing rectangular ones with a single removable divider as an extra lunch box option. These BPA-free, leak-proof containers are a non-toxic alternative to plastic containers. They are ideal for sandwhiches, salads, fruit, veggies and slices to take to work or school. Take away lunches just got a whole lot easier. For those struggling with what to pack for school or work lunches follow me on social media where I post daily photos of what my 2 monkeys are taking to school with them each day. Almost always grain-free and occasionally dairy-free and always crap-free. On weekends we are offering our sneaky broth and butter infused coffee. Made with Sacred Grounds certified organic coffee beans, filtered water, 100% grass fed butter and a sneaky broth cube (which you can't taste but adds nutrients) this hits the spots without giving you the jitters as the broth and butter slow down the release of caffeine. refrigerated items to Sydney and Wollongong. * At this stage only the Star Anise Organic Whoelfoods products can be purchased on our online store and not third party products like lunchboxes, Red Boat sugar-free fish source, fermented cod liver oils, raw milk cheeses, wild Canadian salmon and tuna, GelPro gelatin and collagen powders, olive oil etc. I aim to include include these their party products in our online store in the coming months. third party products in your email order. our products. Best to call ahead to confirm if they have what you’re after). 4. BROTH BAR & LARDER has a phone number! Finally! 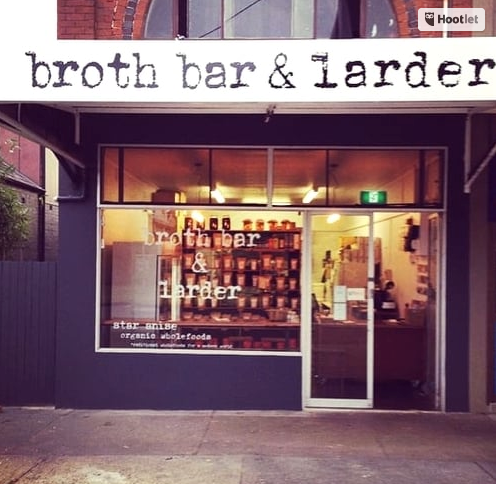 Customers can now call my retail store Broth Bar & Larder directly on our NEW SHOP NUMBER 📞 0421 786 009 for all product availability enquiries and for all pre-orders of the meal of the day or other products. Pre-orders are welcomed and encouraged as we do tend to sell out quickly of certain items especially the meal of the day. We are open 7 days (excluding public holidays) 8am-6pm and are located at 49 Belgrave St Bronte. Feel free to contact me directly on info@staraniseorganic.com for all enquiries relating to health coaching, cooking classes or other workshops, and talking engagements. I have a few spaces left in my All Things Chocolate Workshop on 22 September. For more info and details on how to book, click here.